Years after exposure to space radiation, many astronauts' vision becomes clouded by cataracts. Understanding why may shed light on cataracts suffered by elderly people. October 22, 2004: Gazing out of their space capsules, Apollo astronauts witnessed sights that humans had never before seen. They saw the breathtaking view of the Earth's bright blue disc against the inky black of space. They saw the far side of the Moon. They also saw strange flashes of light inside their eyeballs! Since then, astronauts aboard Skylab, the Shuttle, Mir, and the International Space Station have all reported seeing these flashes. 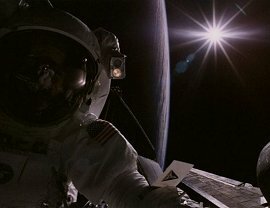 No need to call Agents Mulder and Scully of The X Files, though: what the astronauts are experiencing is space radiation zipping through their eyes like subatomic bullets. When a "bullet" strikes the retina, it triggers a false signal that the brain interprets as a flash of light. Needless to say, this is not good for your eyes. Years after returning to Earth, many of these astronauts developed cataracts--a clouding of the lens, which focuses light onto the retina. At least 39 former astronauts have suffered some form of cataracts after flying in space, according to a 2001 study by Francis Cucinotta of NASA's Johnson Space Center (see journal references below). Of those 39 astronauts, 36 had flown on high-radiation missions such as the Apollo Moon landings. Some cataracts appeared as soon as 4 or 5 years after the mission, but others took 10 or more years to manifest. Scientists have long known of this link between radiation and cataracts, but they've never fully understood it. What exactly does radiation do to the lens of the eye to make it cloudy? Are astronauts' genes involved? Which ones? Solving this puzzle might help people on Earth. Without ever traveling through space, more than half of people older than 65 get cataracts; cloudy lenses seem to be a natural result of aging. These old-age cataracts, some of them, resemble the cataracts astronauts get. If researchers can figure out what's happening inside astronauts' eyes, they might be able to develop medicines to stop the process. That goal is many years away, though. First, "we have to understand the details--the genes and proteins and molecular pathways involved," says Eleanor Blakely, a scientist at the Lawrence Berkeley National Laboratory (LBNL). Supported by a NASA grant, she and her colleagues are experimenting with human eye tissue to learn these details. "For good vision, the lens of the eye must be crystal clear," she says. 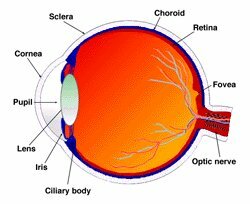 The lens, shaped like an M&M, sits in the opening of the eye and focuses incoming light onto the retina. "At the center of the lens are transparent cells called 'fiber cells.' Damage to the lens can lead to clouding of the fiber cells, and this change in clarity is called a cataract." In a healthy human eye, new fiber cells are constantly manufactured to replace old ones. The process begins with "epithelial cells," a type of stem cell that coats the front of the lens. When needed, epithelial cells flatten out and shed their nucleuses and other internal structures to become transparent fiber cells. It's an amazing metamorphosis. "During the final stages," she says, "all of the cell's organelles are disposed of by the cell in a carefully orchestrated process that leaves the cell alive, but basically a bag of crystalline proteins." Blakely's group has shown that a radiation dose can upset the metamorphosis of epithelial cells, interfering with the formation of fresh fiber cells that make up the body of the lens. They didn't deliberately irradiate people's eyes to figure this out, of course. Instead, they cultured human epithelial cells in petri dishes. As some of the cells were beginning to turn into fiber cells, her team exposed the cells to controlled doses of radiation. This work was done at LBNL and at the NASA Space Radiation Laboratory at the Brookhaven National Laboratory in Long Island, New York. Afterward, they used modern genetics tools to find out how the cells' genes and proteins responded. They've found that a particular gene, Fibroblast Growth Factor 2 (FGF-2), jumps in activity eight-fold following a radiation dose. FGF-2 normally helps cells respond to stress. In this case, it seems to boost the activity of two other genes called "p21" and "p57." These genes control crucial events in the life cycle of a cell--e.g., when a cell divides to form two daughter cells, or when an epithelial cell transforms into a fiber cell. Blakely suspects that an imbalance of p21 and p57 leads to the formation of abnormal fiber cells and, thus, cataracts. It takes a while for abnormal fiber cells to accumulate and visibly fog the lens. Years go by after high radiation missions before astronauts notice their cataracts. The time delay complicates research. It's hard to pinpoint the cause when you have to wait years for the effect. Early detection of cataracts is a goal of Rafat Ansari, a physicist at NASA's Glenn Research Center, working independently of Blakely. He has developed a laser probe that can detect signs of cataracts in humans years before they become visible. It's being clinically tested now at the National Eye Institute. Eventually, astronauts might carry such a probe with them on space missions, checking their eyes as they go. Another team of researchers, led by Leo Chylack, Jr., MD, of the Center for Ophthalmic Research at Brigham and Women's Hospital in Boston, is comparing cataracts in astronauts, test pilots and members of the ground crew at the Johnson Space Center. They'll take stereoscopic pictures of the subjects' lenses to investigate differences in the type of cataracts these people get--another piece of the puzzle. Meanwhile, Blakely is going back to the lab to learn more about the molecular underpinnings of it all. "We're still establishing the links between changes in FGF-2 and [the other genes]," she says. And there are other questions. For instance, cataracts usually develop slowly, but could sudden big doses of radiation accelerate the process? Astronauts taking off on a 6-month trip to Mars will want to know. Her group recently won a four-year extension of their NASA research grant. Stay tuned for updates.